You are more likely to hear the loud wee-eep of this flycatcher than see it. While the Great Crested Flycatcher is brightly colored for a flycatcher with its yellow belly and rusty wings and tail, it spends most of its time high in the trees hawking insects. Unlike any other eastern flycatcher, the Great Crested Flycatcher nests in cavities. It is a summer resident throughout the southern Canadian provinces and all the states east of the Great Plains. Some Great Crested Flycatchers spend the winter in southern Florida and Cuba, but most travel to southern Mexico, Central America, and northwestern South America. The Great Crested Flycatcher is present in Tennessee only during the breeding season arriving in early May and departing by late September. Description: This large noisy flycatcher has a bright yellow belly, an olive brown back, cinnamon-rust on the wings and tail, and wingbars. When excited, it shows a short fluffy crest. The sexes are alike in plumage with males slightly larger. Voice: The song is a bold, loud, clear, up-slurred wee-eep. 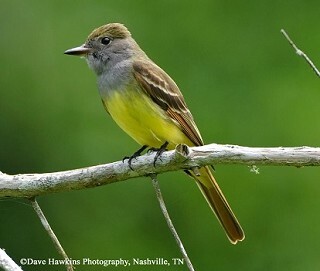 No other Tennessee flycatcher has the combination of a yellow belly and cinnamon-rust wings and tail. Habitat: They breed in open deciduous woodlands, old orchards, riparian corridors, wooded swamps, parks, cemeteries, and urban areas with large shade trees and cavities suitable for nest sites. Diet: Insects, other invertebrates, some small fruits. Nesting and reproduction: Both the male and female vigorously defend the nest site. Clutch Size: Usually 4 or 5 eggs, with a range of 4 to 8. Incubation: The female incubates the eggs for 13 to 15 days. Fledging: Both parents feed the young, which leave the nest after 13 to 15 days. They remain with the adults for up to 3 more weeks. Nest: Great Crested Flycatchers prefer natural cavities in trees, but where these are unavailable they will use abandoned woodpecker holes and a variety of human-made structures such as Purple Martin houses and Eastern Bluebird boxes. The female will line the cavity with leaves, grass, hair, and often a snakeskin. 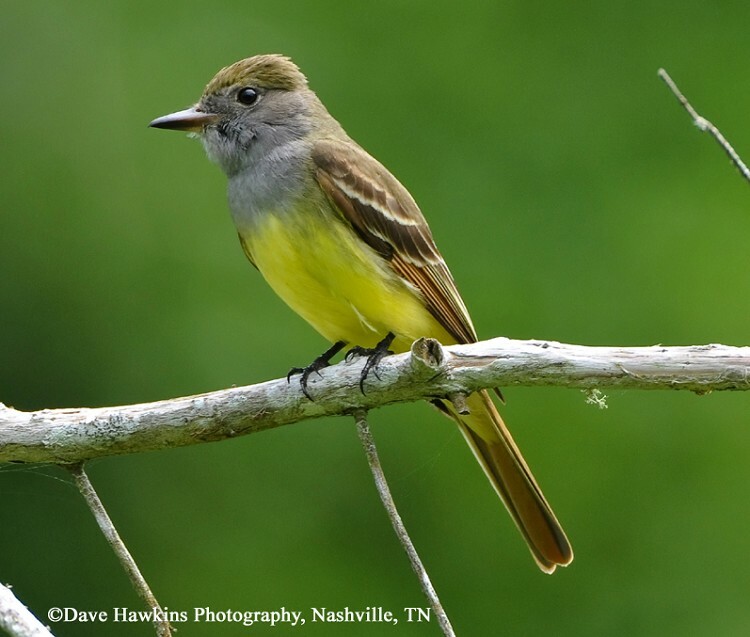 Status in Tennessee: The Great Crested Flycatcher is a fairly common summer resident at low elevations across Tennessee, arriving in mid-April and departing by mid-September. Their numbers appear to be stable. Great Crested Flycatcher nests may contain a shed snakeskin or other similar material, such as plastic, cellophane, or an onion skin. The characteristic loud wee-eep call of the Great Crested Flycatcher can be heard on both wintering and breeding grounds. The oldest known Great Crested Flycatcher in the wild was 14 years, 11 months old. Best places to see in Tennessee: Great Crested Flycatchers are found in appropriate habitat in every county of the state. Lanyon, W. E. 1997. Great Crested Flycatcher (Myiarchus crinitus). The Birds of North America, No. 300 (A. Poole and F. Gill, eds.). The Academy of Natural Sciences, Philadelphia, PA, and The American Ornithologists' Union, Washington, D.C.